Heat treatments produce the most thorough and fast method yet devised for eradicating insect infestations. It is a chemical-free process which can be employed over large or small areas so it is very safe and fast. Since it eliminates insects at every stage of their life cycle, from eggs to the adult insect, it completely destroys the infestation. The heat treatment works by temporarily turning the affected area in to an oven. The temperature is raised to just over 55 degrees Centigrade by a liquid syrup which travels through insulated pipes to strategically placed heat exchanges. The heat exchanges emit air which is hot and dry, creating a lethal environment for insects at every stage of their life cycle. The heat kills the insects in two ways: denaturing the protein in their bodies, and causing dehydration by disrupting the waxy layers on the outside of their bodies. This affects the eggs, larvae and adult insects so the entire infestation is destroyed. 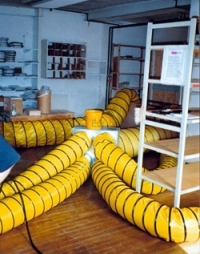 Also, since the heat affects every part of the property it reaches all the places the pests could be hiding, which may be missed through fumigation techniques. The process in monitored with heat probes which feed information back remotely to a laptop where trained pest control technicians ensure that the entire space reaches the required temperature to eradicate the pests, but does not become too high to cause structural damage. Heat treatments can save businesses a lot of time and money. Where fumigation may take days, or even weeks, this process can be completed in merely hours. Hotels. Bed bugs are an increasing pest control problem all over the UK, and while it damages the reputation of the hotel to suffer an infestation, fumigating floors can take weeks. Even then, some insects may be sufficiently well hidden to escape the treatment and begin a new infestation. By using heat treatments however, entire floors of a hotel can be treated on a single day, with the bed bugs being left nowhere to hide. Shipping Containers. To fumigate a shipping container can take anything from a couple of days to a couple of weeks. By using our new heat treatments however, you not have to worry about chemical residues and you can be ensured that your shipment will be pest free in just hours. Food Industry. For the food industry, an insect infestation does not only raise serious health concerns but can also do great damage to a business's reputation. By using heat treatments however, you may not even have to completely shut down your operation while the affected area is treated, ensuring both the health and reputation of your enterprise. These are just a few examples, there are many more cases in which heat treatments can be effective, for instance even trains and buses can be treated in this way. Get in touch on to find out more. It is not just in the commercial sector that it is important to get rid of pests quickly and effectively of course, if you have insects in your own home you will want to be rid of them as fast as possible. Cockroaches. Notoriously difficult to eradicate because they tend to nest behind the walls, a heat treatment will eradicate them completely without the need for chemicals. Bed Bugs. These creatures are so small they make excellent hiders, meaning that even when chemicals are used some may escape the first treatment. With a heat treatment however, there is nowhere they can hide and you will be able to sleep easy. Woodworm. Wood boring insects can be difficult to eliminate because they are mostly located inside wood, but with heat treatments this poses no problem. This is not a comprehensive list, so whatever problems you have with pests in your home or place of business, please get in touch and we will be able to recommend the best course of action.